Friday morning found me in Central Park again. I had hoped to meet up with someone for a bit of birding before business hours. Though those plans never materialized, I did manage to squeeze in almost two hours of birding and still get home by 8:30 AM. My eyes, I should point out, didn’t start working right until about 7:45! Actually, my blurry vision wasn’t much of a handicap since there was very little to see in my first hour in the park apart from White-throated Sparrows and American Robins. The more demure birds were probably put off by the frenzy of fornicating House Sparrows and Common Grackles. Blue Jays didn’t care, of course, nor did European Starlings, Red-winged Blackbirds, or Northern Cardinals. But I didn’t drive into Manhattan to see those birds. I put off walking the Ramble at first, scoping out Turtle Pond and Belvedere Castle instead. Not much was happening there: a Great Egret here, some Yellow-rumped Warblers there, but certainly nothing to wake up at dawn for. Things didn’t pick up until I got deep into the Ramble. I pushed through the Mourning Doves and Hermit Thrushes in search of sassy spring migrants and I found them. First a Palm Warbler, then my first Eastern Towhee of the season, and finally, paydirt. I visited the edge of a lake looking to hustle up one of the many Louisiana Waterthrushes that have been loitering around Central Park. Only a couple of minutes passed before a Seiurus-species wood-warbler popped out for a visit. 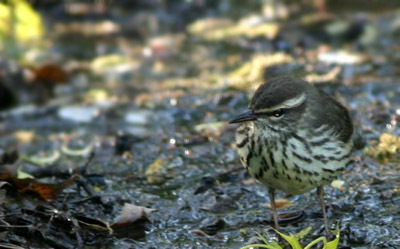 Here’s some more bad news… the bird was a Northern Waterthrush! You might have been able to tell from the photo, as the bird displays the faintly spotted throat, heavily streaked breast, and unspectacular supercilium that distinguish S. noveboracensis from S. motacilla. If you’d been there, you might have identified it by its bold song. I knew because a friendly chap sporting binoculars told me so. Noting my crestfallen expression, he quickly pointed me towards a Louisiana he’d just spotted nearby. My response was to relocate with alacrity a whole hundred feet or so to begin scanning the muck once more. No waterthrush was immediately apparent, so I focused my attention on the happy family craning their collective necks to scan the canopy of a tall tree. More precisely, I focused on the objects of their attention, the many warblers gleaning the lofty leaves. Who doesn’t love a multi-species tree, where different birds burst from every branch? I picked out Pine, Yellow-rumped, Palm, and Black-and-white in less than five minutes, and it wasn’t even May yet! Better yet, when I turned back to the bank, there was my life Louisiana Waterthrush, bold eyebrow beaming. A perfectly proper two waterthrush morning, marred only by my errant image stabilization and the fact that Sara wasn’t present to share the lifer. To be specific, though, this was actually a four waterthrush day, three Northerns and the one Louisiana if I don’t miss my guess. You see, I think, at least for the moment, I can finally tell the two apart.